While it might seem strange to some, there is nothing unusual in France, Spain, or Portugal in tucking into a fresh portion of escargot – a dish made of cooked land snails. The squeamish among us might baulk at the idea, but even for culinary adventurers it is not advisable to simply go out to your garden and collect a potful of molluscs. The gastronomic art of cooking escargot has been perfected over generations, and so here’s a rundown on how it’s done. 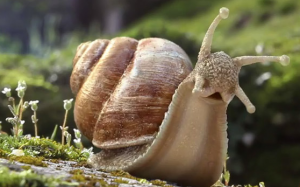 There are only a few species of snail that tend to be used for cooking. 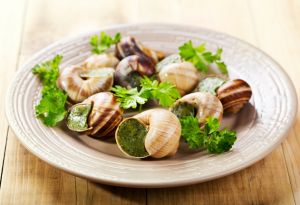 In France, the Burgundy snail is most popular in the kitchen, along with the common garden snail and the Turkish snail. The Quimper snail can also appear on menus throughout Europe. Not all snail species are edible, and these are considered to be the ones with the most succulent flesh. Others may be just as tasty but are so small that the work required in preparation is simply not worth the time. The idea that snails might be dirty, or unhealthy to eat, is quite wrong; they are in fact a great low fat source of protein. But of course they have been crawling around on the ground outside, so there is a necessary process called purging that the snails must go through before being cooked. Traditionally, purging involved a period of fasting for the snails of five or six days, all this time being kept in a wooden box. The snails are then washed in running water and placed into a large container with layers of salt in between them. The salt makes the snails foam and disgorge any unpleasantness. They are then washed again. Farm raised snails undergo a simpler process, being kept away from soil in a grated box and washed daily. Feeding them with dill at this time makes them taste better later. By now the snails should be purged, so then they are boiled for three minutes and then the flesh removed from the shells. Most often the hepatopancreas organ, the snails’ equivalent of a liver, is removed and the flesh is soaked in salty water for a half hour. After one final wash the meat is ready to be cooked or frozen. The most common recipe for cooking your escargot is to make up a mixture of butter, garlic, and herbs to coat the inside of the empty shells. The earlier removed flesh is replaced in the shell, and more of the butter mix stuffed on top. The reconstituted snails are then placed on a baking tray in the oven. Simple as that. 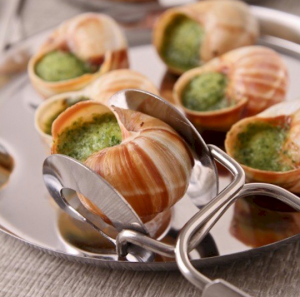 There are special tongs and forks designed for holding escargot and digging them out of the shells, but they’re not essential to your enjoyment of the tasty meat. And don’t worry, the majority of people buy their escargot clean, purged, prepared and all ready to cook, even in tins, so you can easily expand your gastronomic horizons without the days of preparation beforehand.